In 1066 A.D., William the Conqueror invaded and secured England for himself and his followers in a short time. In 1086, he ordered the first census of the country to establish taxes based on the land held by his supporters, be they Norman or English. This census or survey of the holdings in his domain is known as the Domesday Book and is still extremely important in English law. It did not, however, cover much of the northeastern part of England, the land north of the River Tees. That was not comprehensively surveyed until 1183 and was not based on the same sets of information used in the Domesday Book, much to my delight. While it is not known exactly why this land area was not surveyed earlier, unrest and disturbances from both the north (Scots) and south (Normans) was the probable reason. By the late twelfth century, the See of St. Cuthbert was consolidating its power of legal jurisdiction, actually excluding some of the king’s rights and rules. The See did its own survey/census to indicate rights and taxes owed to it. What has all this to do with Greyhounds? A lot! The Boldon Book which records this survey conducted under the rule of Lord Hugh, the Bishop of Durham, mentions a number of Greyhounds. While I will not go into great detail concerning the entire survey, I suggest that people interested in life in medieval days look into this book. The books describes how the people paid their “taxes” and intimates what life was like at that time. The term dreng or drengage is used. This referred to a tenant who owed light personal service to his lord and who held large areas of arable land. He was of intermediate status as a high-ranking villain and had some authority in a township or shire. The Great Chase was the bishop’s hunt in Upper Weardale, an area that was later to become a formal park. Many of the personal and drengage services listed in this survey involved the provision of men, Greyhounds, and ropes for impounding the deer during this formal hunt. In 1183 A.D., fifteen men owed the use of their Greyhounds to the bishop during the Great Hunt. The number of dogs varied from one to three, and in one case included “2 parts of 2 Greyhounds.” This last was owed by Hugh of Herinas at Herrington who owned “The Two Parts of Herrington”. It is interesting to see that he also owed two parts of several other things: a cow for metreth (May tribute), a man for castle-guard, and a cask of wine. Judging from the various items owed for the Great Chase, a fairly large number of men were required. They held ropes to form an enclosure of sorts into which some men drove the hounds that drove the deer. Other men waited inside for the killing. Remember that the main purposes of these hunts were to provide meat for winter as well as pleasure for the hunters. In many cases, such as that of Henry Hutton, the survey states: “The dreng keeps a dog and a horse, and carts a cask of wine and mill-stones to Durham, goes on the Great Chase with two Greyhounds and five ropes, and does court duty and goes on missions.” An interesting entry for Hulam states that “He goes on the Great Chase with one Greyhound, two-and-a-half ropes and with two men…” How do you handle a half a rope? Lest you think the dogs poorly kept during the hunt, another township — Stanhope — was required to provide (literally build) a kitchen, and a larder and a dog kennel at the Great Chase. The members of the Chase also provided straw for the hall, chapel and chamber and lead all the Bishop’s supplies from Wolsingham to the lodges. The total number of Greyhounds mentioned in the Boldon Book is twenty-six plus the “2 parts of 2 Greyhounds” owed by Hugh of Herinas. Remember that this is only indicative of the hounds owed for the Great Chase. It is highly likely that some of these men owned several more Greyhounds. 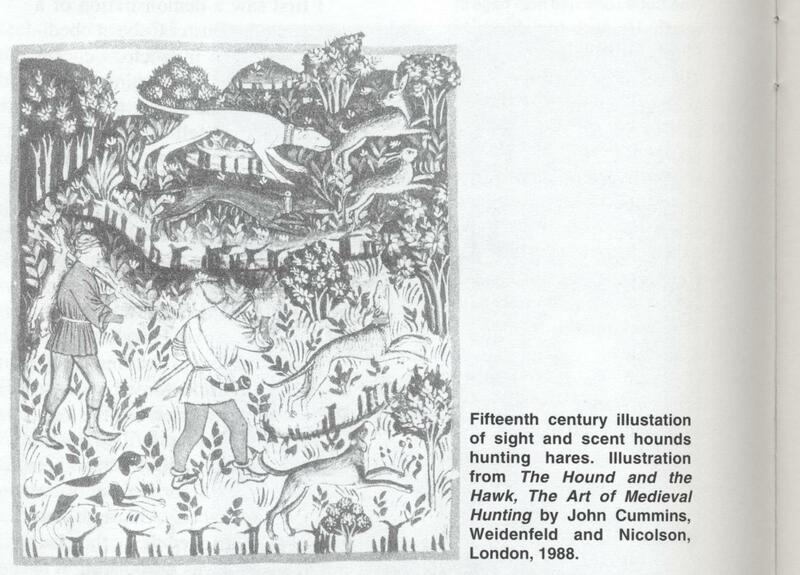 I am relatively certain that Simon Veal of Plawsworth, who is described as being a knight of some standing in the area, owned more than the two Greyhounds which he was obligated to provide for the Great Chase. Although none of the dogs, and few of the men, are named, this census gives a fascinating glimpse of life in the twelfth century and proves that Greyhounds were important in the frame of life. One last tidbit of information: The Greyhounds were not called Greyhounds, as such were termed leporariis. The entire document, written in Latin, was issued by the ecclesiastical scholars in the bishop’s retinue. Even as recently as 1973, Prince Charles of England received his feudal dues as Duke of Cornwall on the grounds of Launceston Castle in the form of two Greyhounds. In this case, the hounds were immediately returned to their owners, Mr. and Mrs. Ralph H. Parsons. The old charter under which certain lands are held in the Duchy of Cornwall decrees that these feudal dues be delivered as part of the terms of tenure, much like the use of the hounds and ropes were required back in the 1200s. There is a photo of this particular ceremony in The Greyhound Owner’s Encyclopaedia by Ivy M. Regan (London, Pelham Books, 1975). Laurel Drew has been a CG Magazine regular contributor since 1997.